Introduction: One promising target for novel psychotropic drugs is the 5-HT6 receptor, GProtein- Coupled Receptor (GPCR) family, displaying seven transmembrane domains. There is considerable interest in how both 5-HT6 receptor agonist and antagonist compounds can have marked procognitive effects. Methods: An exact structure of the 5-HT6 receptor is not available, so application of powerful methods of (Q)SAR and molecular modelling, which play an essential role in modern drug design, are currently limited to structure-based homology models. 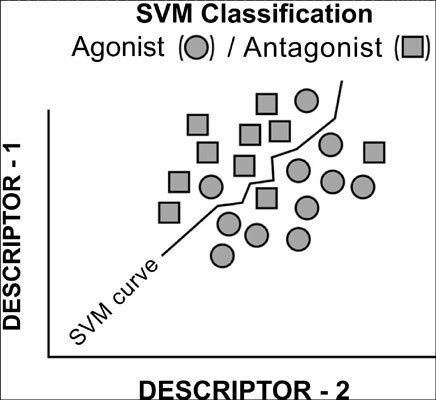 The present study is devoted to a detailed QSAR analysis of 61 drugs (26 agonists and 35 antagonists) acting on the 5-HT6 receptor (rattus norvegicus and homo sapiens). Five classification methods were used: k-Nearest Neighbors (k-NN), Logistic Regression (LG), Linear Discriminant Analysis (LDA), Random Forest (RF), and Support Vector Machine (SVM). Multiple Regression Analysis (MRA) was involved also for regression analysis. Spectra of Inter Atomic Interactions (SIAI) were applied in the search for ligand centres interacting with the 5- HT6 receptor. Results & Conclusion: SAR and QSAR models based on the use of HYBOT, MOLTRA, VolSurf+, and SYBYL programs, and having cross-validated coefficients of determination of at least 0.80, show a predominant influence of H-bond acceptor ability and hydrophobicity on the type of ligand activity and degree of inhibition. 5-HT6 receptor, classification, CNS diseases, modelling, QSAR, regression.